Robert Chapman was born in England & served his apprenticeship with the local Rolls-Royce & Bentley dealer. ​The company also held the franchise for Morris, Worsely, Riley MG, and Rover. All these different makes and models served as good grounding in the trade. 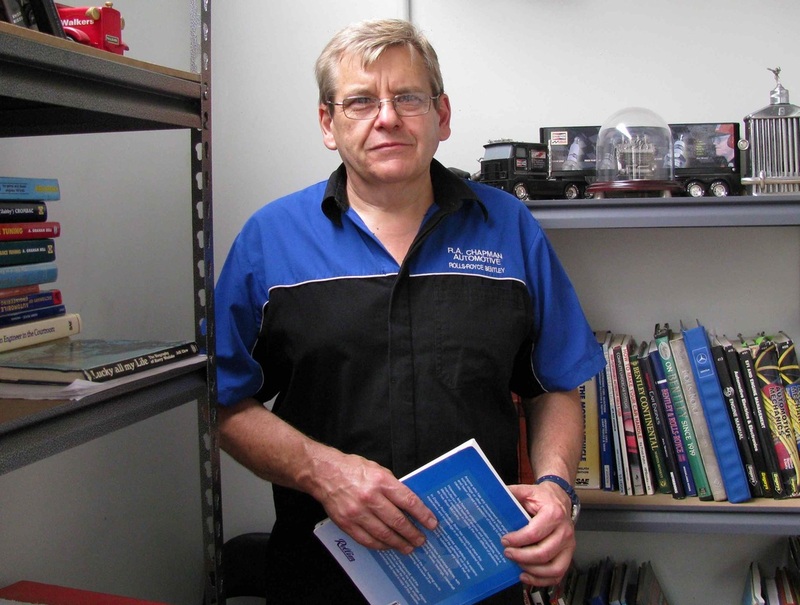 Robert gained his technical education and qualification from Maidstone Institute of Technology and the Tunbridge Wells Institute of Technology in Kent. After completing his apprenticeship, Robert moved from cars to commercial vehicles and diesel engines, during which time he completed several factory training courses before returning to cars, working at the local Fiat dealership in Kent. This was a very interesting and enjoyable position. He recalls that the Fiat technical training facility in London was second to none, and the training staff showed the expected Italian passion for the product, especially when it came to engines. He holds fond memories of this experience and still has a soft spot for Italian cars, and has high regard for Italian engine designers. Other cars of interest to him include the Mini Cooper S, MGB, and the Riley (all built by the British Motor Corporation - BMC), because of their performance when manufactured. Robert migrated to Australia in 1974. After four years of working for other people, he decided to start his own business and over the past 32 years, the business has grown to where it is today. It is Melbourne’s leading independent Rolls-Royce and Bentley service and repair facility, and Australia’s largest manufacturer of replacement parts for Rolls-Royce and Bentley. Robert’s son, Neal, left school on completion of Year 12 and undertook an electrical engineer course at R.M.I.T. before joining the family business as an apprentice motor mechanic. After completing his apprenticeship and gaining several year’s further experience, Neal now runs the workshop side of the business leaving Robert to concentrate on spare parts and customer service. The workshop performs all types of mechanical work, from routine service, to engine overhauls and performance upgrades, to fitting liquid petroleum gas (LPG) systems and complete mechanical restorations. The workshop is very well equipped, the most recent major acquisition being a state of the art computerized chassis dynamometer that takes tuning and fault diagnosis to new levels. The range of Rolls-Royce and Bentley covered by the company (1950-1995) dictates a wide range of special tools and skills. The older cars require more old-fashioned mechanical skills such as fitting, turning, and general engineering skills, the later cars with hydraulic and electrical systems requiring much more dedicated test and diagnostic equipment. Covering such a wide time span, R.A Chapman Automotive sees the history and development of post-war Rolls-Royce and Bentley cars virtually up to the point of takeover by BMW and Volkswagen respectively. The Rolls-Royce Silver Dawn and Bentley MK 6 (1946-1952) were the first cars Rolls-Royce and Bentley supplied fitted with their own factory body on a complete chassis frame. Both of these manual models and their immediate successors, the R.R. Long Boot Dawn and the R. Type Bentley (1952-1955), are still revered and sought after for their style and elegance. The R.R. Long Boot Dawn model (1955) and Bentley Type R (1952) were the first models available with 4 speed automatic transmission. 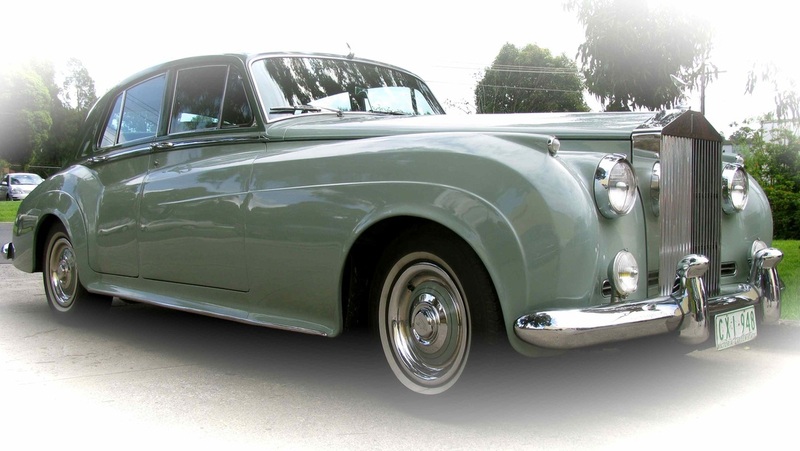 In 1955, the first of a new, larger series of cars was released – the S Class cars – the Rolls-Royce Silver Cloud 1 and its Bentley equivalent, the S1 Bentley (1955-1959). The body style of these cars was to become iconic, and to this day they are still regarded as the model most instantly recognizable as a Rolls-Royce. These vehicles still had a full chassis frame and drum brakes right up until the final Cloud 3 and S3 model ceased production in 1965. Cloud 1 and S1 came with the new larger capacity 4.9ltr straight 6-cylinder engine (with overhead inlet and side exhaust design), which had the same F head design and gave adequate performance and was very smooth running. In 1960, the second in the series, the R.R. Cloud 2 and S2 were released, basically the same vehicle but now with a completely all new, all aluminium V8 engine of 6250cc. Lighter than the old 6 cylinder cast iron engine, the new V8 produced “more than adequate power” and started a production run that has just celebrated its 50th year. This has been far and away the company’s most successful engine. In 1963, the R.R. Cloud 3 and S3 were released, but this time there was a visible difference in the body styling with a shorter radiator grill, lower bonnet line, and four headlamps, along with engine updates which further increased performance and smoothness. This series car was very successful, not only for their style and performance, but also because of their drivability and comfort, and will always be regarded as a classic and some of the company’s best work. Post-war, all cars were built on a full chassis and the Rolls Royce company continued this practice in to the 1960’s, whilst many other manufacturers had recognized the production and safety advantages of the monocoque body construction method. The full chassis method of construction was far more complicated and expensive by comparison. It limited suspension design and therefore road holding, passenger comfort, and also the introduction of deformable body sections (crumple zones), coming at a time when buyers were becoming more safety conscious. In 1965, a new model was released by the company. This heralded a complete change in design thinking for Rolls-Royce. The car was monocoque in design, had four-wheel discs and a completely new hydraulic system operating brakes and suspension. The 6.250 cc V8 from the Cloud 3 was used, but even this had been improved with a new design of cylinder head which had a wedge type combustion chamber to improve combustion, and a repositioning of spark plugs above the exhaust manifold to improve accessibility. The car brought Rolls-Royce into the modern age and was numerically its most successful car to date, with very many derivates being produced between 1965-1980. 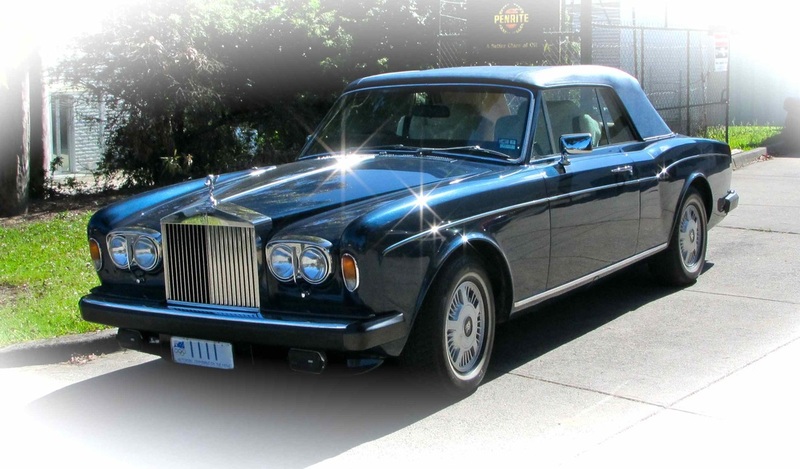 In 1980, the Silver Spirit and the Bentley Mulsanne models were released. These cars had the by now, well proven running gear of the Shadow 2, but with a bigger, more modern body style. The most significant improvement in these cars was the hydraulic system. Gone was the use of normal brake fluid, which had been the Achilles heel of the Shadow system, to be replaced by a new system operated by mineral oil. This oil suffered none of the hydroscopic problems of the old fluid, and maintenance and reliability was improved. These models were still equipped with small HIF carburetors up until 1986 when the first fuel injected cars appeared. This lifted performance and reduced emissions slightly. Famously in 1984, Bentley produced the Mulsanne Turbo with brutal power and performance. The early Turbo cars were carburetor equipped and proved to be troublesome, and were later developed further with fuel injection, engine management, and inter-cooling. These cars were nowhere near as brutal, but every bit as fast. R.A Chapman Automotive realised very early the potential advantages of LPG for Rolls-Royce and Bentley engines and performed their first conversion on a high mileage Silver Shadow in 1994. This car belongs to a Rolls-Royce car club member and is still running on the same engine today, having travelled normally unheard of high mileage for this engine. Since the car was converted to dual fuel operation, many other models have also been converted, including Silver Cloud 1, 2, and 3, (1955-1965) Silver Spirit (1980-1990, carburetor and fuel injected) to the delight of all owners. The much lower cost of LPG fuel is only a small part of the benefits. Probably the more important factor is the increased life of the engine, and also the transformation from a fairly high pollution emitter to a very clean engine. Over the past 20 years, R.A Chapman Automotive has been developing a range of replacement and upgrade parts to suit Rolls-Royce and Bentley cars. These parts have mainly been in the area of braking and suspension. We have also commissioned the manufacture of parts that are prohibitively expensive or very difficult to obtain. The most common form of chassis construction for passenger cars, and increasingly, four-wheel drives. Unlike a ladder frame, where the chassis and body are separate for high strength and used in many older vehicles, monocoques are specifically designed to crumple in the event of a collision and absorb energy, protecting the occupants from the full force of the crash. Most cars now have a monocoque, which is basically a rigid, complex box with mechanical components bolted directly underneath. Name: Robert Chapman Auto Engineer: 45 years. Born: England, and married with two children and resides in Melbourne. Qualifications: C.A.Eng. (Certified Automotive Engineer). Dip.Auto.Tech. M.I.Mech.E. Licensed vehicle tester. AAFRB and VACC. Professional advice: Independent vehicle and component inspections and includes checking failed components. Also prepares independent reports for clients and gives expert evidence in court. Currently Drives: 1970 Silver Shadow sedan (LPG), 1968 Bentley sedan, 1990 Ford Capri 1.6 Turbo, 1995 Honda Legend V6, 2010 Honda CRV Sport. Cars previously owned include, 1960 Austin Cambridge, 1963 MGB, 1964 Mini Cooper S, 1972 Fiat 127 and a 1972 Rover P5B. Interests: Technology and design in Formula one cars built between 1950 to 1980, and driving well built engineered motor vehicles. Phone: 03 9720 3997 Address: 6 Havelock Road Bayswater, Victoria. Note: I met Robert in late 2010 at his workshop and completed the article in 2011.